Dr. Linda Yueh is Fellow in Economics at St Edmund Hall, Oxford University, and Adjunct Professor of Economics at London Business School. She is also Visiting Senior Fellow at the London School of Economics and Political Science’s (LSE) foreign policy think tank, the IDEAS research centre, and was Visiting Professor of Economics at Peking University. Linda Yueh is a TV and radio presenter, including for BBC Radio 4 and the World Service, as well as having fronted BBC TV series, such as The New Middle Class, Next Billionaires, and Working Lives. Previously, she was Chief Business Correspondent for BBC News and host of Talking Business with Linda Yueh for BBC World TV and BBC News Channel based in Singapore. She had been Economics Editor and anchor at Bloomberg TV in London. Prior to that, she was an attorney at Paul, Weiss, Rifkind, Wharton & Garrison in New York. Dr. Yueh is Chair of the Royal Commonwealth Society and a Non-Executive Director of Rentokil Initial as well as Trustee of the Coutts Foundation and Malaria No More UK. She serves on the Policy Committee of the Centre for Economic Performance (CEP) at the London School of Economics, and on the Advisory Board of The Official Monetary and Financial Institutions Forum (OMFIF). She is a Fellow (FRSA) of the Royal Society of Arts (RSA). She is a widely published author and Editor of the Routledge Economic Growth and Development book series. Her latest book, What Would the Great Economists Do? How Twelve Brilliant Minds Would Solve Today’s Biggest Problems was released June 5, 2018 from Picador. Professor Yueh has advised the World Bank, European Commission, Asian Development Bank, World Economic Forum in Davos, among others. She was Non-Executive Director of the FTSE-listed companies, JPMorgan Asian Investment Trust and Baillie Gifford’s Scottish Mortgage Investment Trust. She was previously Co-Chair of the Global Cities Business Alliance (GCBA) of London First; Board Member of London & Partners; and adviser to the British Chambers of Commerce (BCC). You can follow Dr. Yueh on Twitter. Since the days of Adam Smith, economists have grappled with a series of familiar problems – but often their ideas are hard to digest, even before we try to apply them to today's issues. Linda Yueh is renowned for her combination of erudition, as an accomplished economist herself, and accessibility, as a leading writer and broadcaster in this field. In What Would the Great Economists Do? she explains the key thoughts of history's greatest economists, how our lives have been influenced by their ideas and how they could help us with the policy challenges that we face today. Ideas That Have Changed How We Live Which economic ideas have most influenced the economy? Dr. Yueh discusses ideas from her book, What Would the Great Economists Do? She covers the battle of ideas through history, such as how the market economy overcame socialism in the 20th century and why we are now at a crossroads. The consensus about how to run the economy has broken down--Dr. Yueh explores why, and most importantly, she fashions solutions to reshape economic policies to make them work better for the 21st century. Global Economic Prospects What are the economic and geopolitical trends that are shaping the world? What should we look out for in terms of opportunities and risks? Dr. Yueh discusses the U.S., China, EU, emerging economies, and more. We live in an age of prosperity, which is likely to become a second golden age (the first was during the 1950s when Americans became prosperous). The emergence of a new global middle class and the digital era means there are more opportunities than ever before. But are we ready to seize them? Country-Specific Economic Outlooks The U.S., China, Brexit, the EU, emerging economies (e.g. Asia). Dr. Yueh can discuss one of these countries or several of them in pinpointed economic forecasts. What should we expect in the American/Chinese/British/European economies? What drives innovation in the digital age in America? Can China grow rich? What will Brexit mean? Will the euro last? Will developing Asian/emerging markets continue to grow well? Read why Dr. Yueh thinks the Bank of England should target growth. Dr. Yueh talks about the diamond-water economic paradox on NPR. Financial Express reviews What Would the Great Economists Do? Newsday picks What Would the Great Economists Do? as a great summer read (about finance). Discover why Newsweek named What Would the Great Economists Do? one of the 50 coolest books to read in summer 2018. Watch Dr. Yueh on CNBC talking about what history tells us about trade deficits. Listen to Dr. Yueh on WNYC’s Brian Lehrer Show. 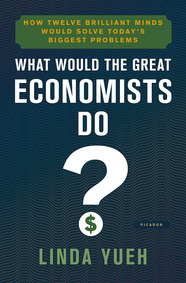 Read the Kirkus review of What Would the Great Economists Do? Visit Dr. Yueh’s personal website and connect with her on Twitter. "We have had a huge amount of compliments from attendees about Dr. Yueh's speech and Q&A, and we thought she did a fantastic job." "She is an excellent speaker, she knows her subjects perfectly, she's able to answer any question, and on top of that she's a very nice and accessible person to work with." "A knowledgeable economist who is a great presenter. She clearly knows her subject well." "Linda is a fantastic speaker with a great command of her subject. She is highly personable and very approachable." "Very knowledgeable. She kept delegates focused on what could have been quite a dry subject!"